Learn Free Youth Soccer Drills! "Learn Youth Soccer Drills for FREE"
Then 'Free Youth Soccer Drills' is the website for you. ...and of course, every drill has colorful and clear diagrams! Click on the below coaching manual to purchase a printable version of the soccer drills for only $3 each! 'FYSD' is a totally free site (no catches!) So, why am I doing this? I am providing this content simply because I do not want to forget all the coaching drills I have learnt and coached over the past few years - free soccer coaching for you. I have enjoyed everything to do with soccer since I was four years old. In the last few years I have been coaching soccer in America to all ages and abilities. I currently live in England where I am working on giving YOU all the information you could ever need on youth soccer drills. 'FYSD' is the website for you if you want fun games for the 'younger youth players' or more advanced soccer drills for the 'more capable players'. Make your soccer club famous with their very own web-page....for FREE. Click here for the 'My Soccer Page' link to find out more!!! Need some extra motivation from your players? Then why not get some soccer patches and reward players for trying harder and achieving new things. Soccer patches easily iron on to jerseys and can also be pinned to sports bags. Click on either photo to find out more! I know how important it is to coach each age group in the correct manner. For example, younger players need to play fun games whilst also keeping it soccer related. Whereas the more advanced players and teams need drills that will help them develop appropriately. Therefore, my website is split into soccer drills that are age relevant. Starting with the incredibly fun U4 age group and working up to the adult more technical soccer drills. 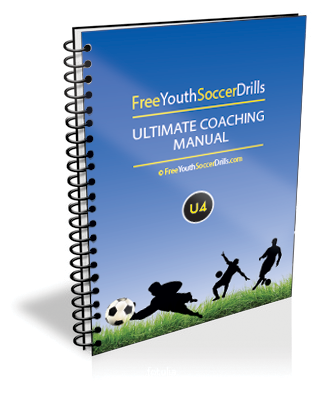 Free Youth Soccer Drills is all about giving you the best hints and tips to be a successful soccer coach. Check out the top 10 mistakes that coaches make. 10 Things Soccer Coaches Get Wrong! 1. A lack of preparation and it shows. 2. A lack of passion and it shows. 3. Coaching wrong drills to the wrong age group. 4. Forget to include coaching points. 5. Forget to compliment the players. 6. Play drills that involve players standing around. 7. Don't allow players to experience different playing positions. 8. Don't do any progression to the drills. 9. Don't change a drill thats not working. The image below is taken from a U4 soccer drill called 'Animal Hunt' which can be found on this website by clicking on the 'U4-U5 Drills' tab on the left hand side. As well as providing a diagram, I will tell you what setup preparation is required prior to coaching the drill, an explanation of the drill, how the drill can progress when the players have the hang of it and what coaching points should be discussed throughout. As well as offering soccer drills I am also providing information on various other soccer related topics such as soccer rules, positions, nutrition, stretching exercises and much, much more! Below is an example picture of a 4-4-2 formation andby clicking the link below you can see a host more of soccer formations with an explanation as to there strengths and weaknesses. If I like it, it's mine. If it's at my feet, it's mine. If I can take it from you, it's mine. If I had it a little while ago, it's mine. If it's mine, it must never appear to be yours in any way. If I'm doing something with it, obviously it's mine. If it looks like mine, it's mine. If I think it's mine, it's mine. If it's yours and I steal it, it's mine. If I get it, I keep it, and I score. That's the FYSD way! This Free Youth Soccer Drills website is currently under development and new drills and other soccer related information are constantly being added and updated. I have had so much fun coaching these soccer drills that I wanted to put all my information down into this website... I hope you find it useful and relevant. 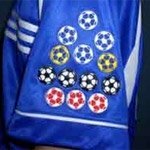 Interested in motivating your players... click here for soccer patches!